Onion Goggles: Gnocchi success at last! Gnocchi are a fabulous pasta. When done right they're like delicious little down pillows. When done wrong they're a bit like eating chunks of old gum. I was always told that the key was not to add too much flour and not to work them too much. In practice I found this a bit like taking advice from Wayne Gretzsky "Just go to where to puck is going to be! ", great in theory but practically impossible. 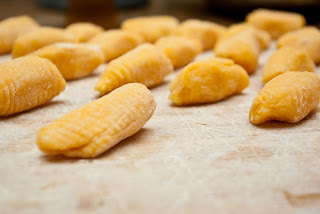 Gnocchi are our white whale ... or at least they used to be. Some of our greatest kitchen disasters and best concrete substitutes have come from failed gnocchi attempts. It actually got to the point where T-Moo wouldn't even try any more and the mere mention of gnocchi would cause her to lie on the floor and scream like a tired 3 year old in a grocery store. So I was ecstatic when I took a cooking class on a recent business trip to London and finally learned how to make Gnocchi in a reliable way. It turns out the key, like a fine cigar, is hand rolling! Scoop the inside of the potatoes into a bowl and mash with a fork until it's no longer chunky or use a potato ricer if you have one (I have two ... for some reason). 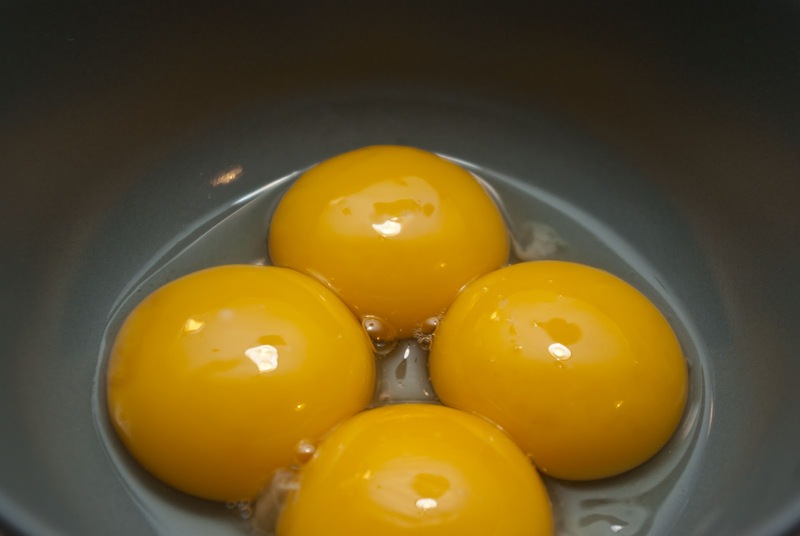 Add the eggs and mix thoroughly, slowly adding flour until it starts to form a dough ball. It will start like a bowl of wall paper paste but should start to come together after adding a couple of tablespoons of flour per potato (the amount will depend on the size of the eggs and potatoes). When the dough starts to come away from the side of the bowl pick up a chunk about the size of a baseball with your hands and roll it around in the flour to dust it all over (your hands will get very dirty). 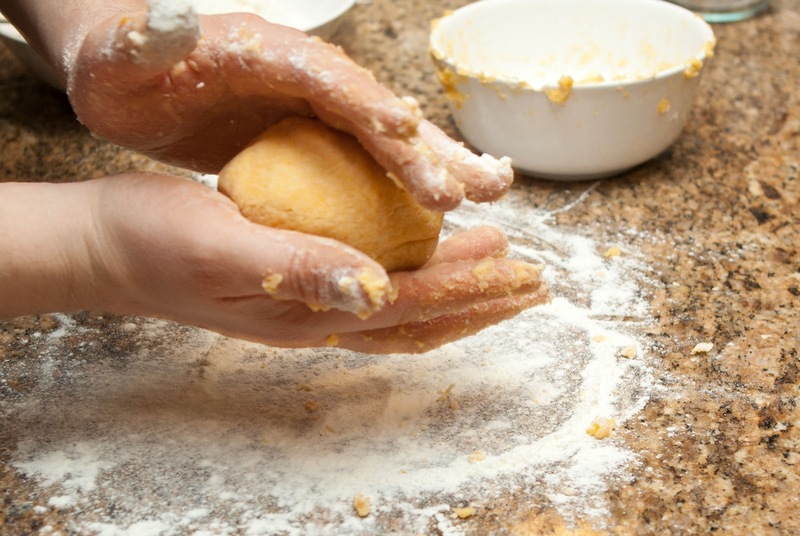 Once dusted, pick up the dough ball and roll it around in your hands until it becomes wet again (the egg will seep through as you roll) and then re-dust and repeat rolling. 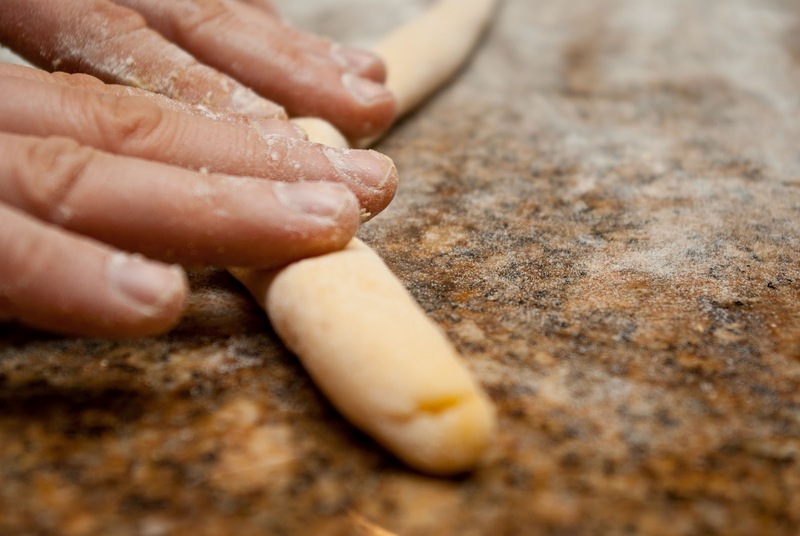 Repeat this rolling and dusting process until the egg stops seeping through the flour dust (usually 3-5 times). The dough won't firm up much because there isn't any gluten in the potatoes and so you have to treat it gently. 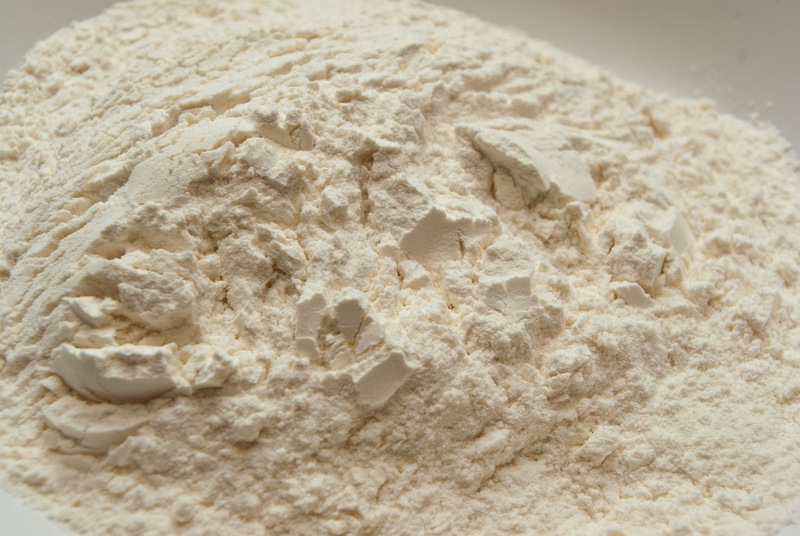 Flour an area of your counter or cutting board to work the dough. 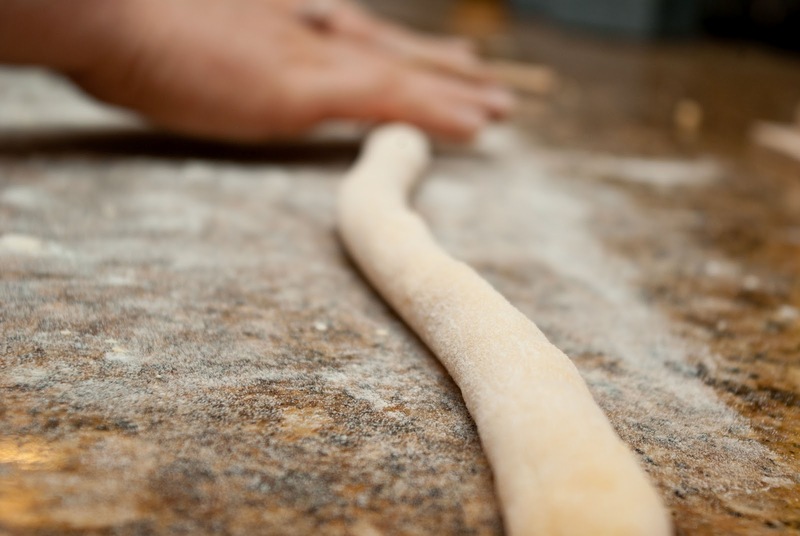 Take the dough balls and roll them into long snakes about 2cm thick much like you used to do with PlayDough when you were a kid (you used to do that too right?). You can now use a fork to gently press grooves into the snakes or leave them as is. Cut the snakes into pieces about 2-3cm long. The dough will still be very tacky inside and quite soft so the best way to do this is to chop down quickly and then flick the pieces to the side with your knife to prevent them from sticking to each other and to the knife. Add the gnocchi to a large pot of boiling salted water. They're done when they float. Avoid over cooking them as they'll just disintegrate into the pasta water. Glad to hear it Tiffany. It's messy but worth it. 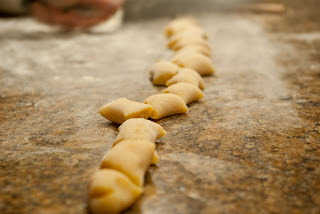 By the way, I love your squash and mushroom tortellini recipe. You should try it. It is one of my recent favorites! Liebster Blog - Thank You!